We had one week in Buenos Aires before our flight back to the United States and our “No Plan Plan” meant that we could do anything that would take about a week and keep our legs in shape for the upcoming Race Across America (remember, we’re training for RAAM?!). 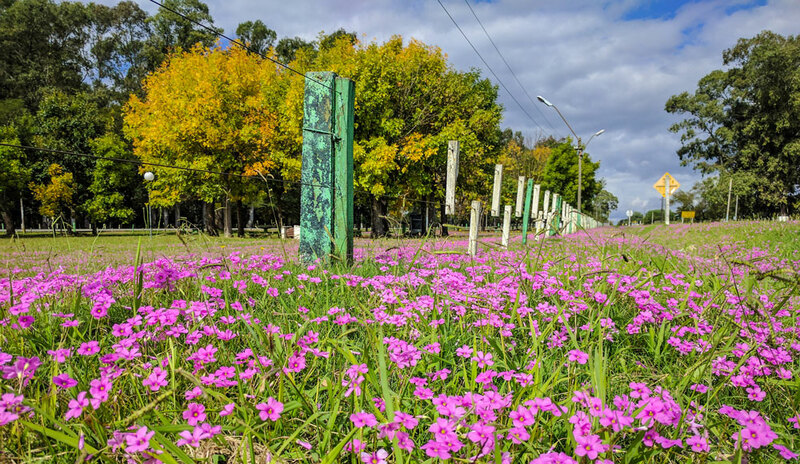 A month earlier we had coffee with a cyclist from Buenos Aires while riding down the Carretera Austral and he told us his favorite loop is to ferry from BA into Uruguay and ride back home. Sold. 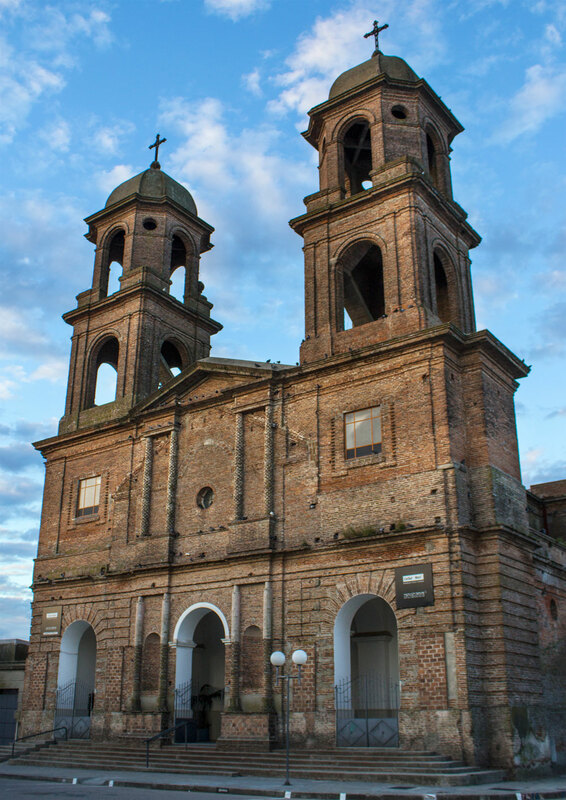 We bought tickets and loaded the bikes onto the ferry for Colonia del Sacramento, a gorgeous Portuguese colonial town and a UNESCO World Heritage Site. The historic center was bustling on a Sunday, but unfortunately for us the banks were closed and it took a few frustrating hours to find cash, get groceries, and ride out of town. Uruguay, though, would be worth the work. The gentle rolling countryside was vastly different from the raw and rugged mountains in Patagonia, but the laid back vibes in each little town were a much welcomed change. We simply looked at Google Maps and picked roads and meandered in and out of small towns and villages, sitting on park benches, eating lunch in parks, and rolling down country roads passing tractors and horse carts. We camped along the road, by rivers, in fields, and in several free campsites in small towns. Uruguay was quickly becoming one of my favorite countries in the world. Spinning past miles of soybean fields reminded me of being back home in Indiana. As we reached the last stretch of road in Uruguay our El Grande Sur adventure was rolling to an end. 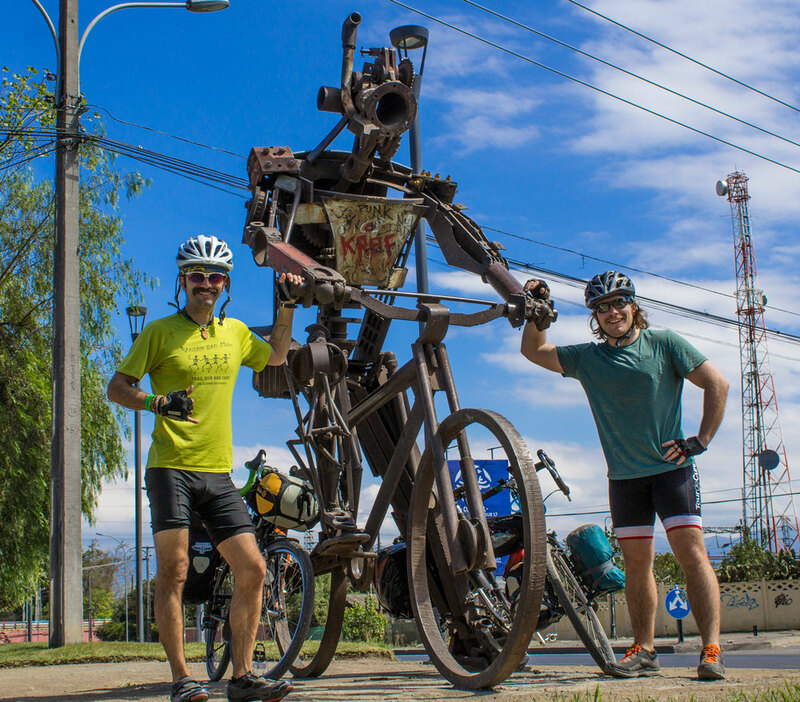 We just needed to cross back into Argentina and pedal back to Buenos Aires to catch our flight home. Little did we know that this would be the sketchiest part of our trip. At the border crossing we were permitted to reenter Argentina, but were told that we could not cycle across the large suspension bridge and had to find a ride. 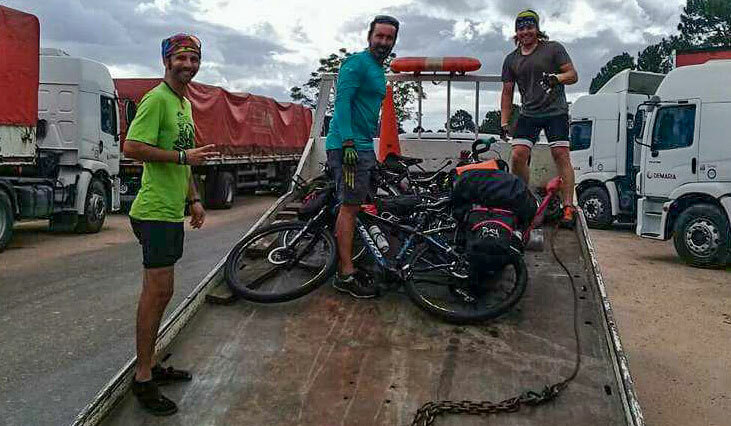 We stood with our thumbs up until another cyclist from Buenos Aires arrived and helped find a tow truck driver who was willing to shuttle us all across for a small fee. Now we just needed to ride back to BA. The first stretch down Highway 14 wasn’t bad. We stayed on the frontage roads while truckers zoomed past on the freeway. But by that afternoon the side roads disappeared and we were committed to the 4 lane highway. To make matters worse, the road shoulder disappeared and we were riding the white line, which was sometimes covered with grass. Semi trucks two abreast passed us as felt the heat radiating off the engines. It was nerve wracking. Spoiler Alert: We survived. And, Ryan even helped some guy chase down his lost horse. I’m not kidding, watch the video below! Anyway, we reached the outer loops of Buenos Aires and started taking frontage roads again. It was even more incredible that within 10 KM of the one of the largest metropolitan city centers in South America we were actually riding on more forested dirt roads. A fitting end to our 2 month bicycle tour. As a final farewell gesture it rained on us that last afternoon. We were soaked as we rode into Buenos Aires and started navigating city traffic. Additionally, within a kilometer of our final hostel I hit a bump and one of my panniers fell completely off. Yes, we were wrapping up our bike tour in style. Once clean, dry, and settled in the hostel we began the process of selling our bicycles. We’d heard that Surly’s are hard to find in South America and these bikes, though they had been ridden across the United States and around Patagonia, could command nearly their purchase price in Argentina. Within a day Ryan had sold his bike and I sold our friend Matt’s bike for him. That’s another story for another time, but if you’d like to know why I’m still driving around with a wad of 21,000 Argentinian Pesos in my van just ask. All in all we’d covered an unknown number of kilometers in 2 months, had an infinite number of laughs, made lots of new friends, and came home with enough stories to last us to our next international adventure. In the meantime though, we were focused on finishing our training for the 3,000 mile Race Across America.